This piece was originally published as a review on Game Boyz on 8/7/2011. Groove Coaster was released on the iOS last week, and I’ve had trouble staying away with it. Following in the footsteps of Space Invaders Infinity Gene, Groove Coaster is Taito’s newest offering. At only $2.99 it delivers a fantastic music experience that I highly recommend. In Groove Coaster, your avatar follows along a set line. Icons on the line set to the music indicate when you should tap the screen. As the game progresses, the complexity increases as well. Besides regular tap notes, Groove Coaster introduces holds, sliding holds, flicks, and more. 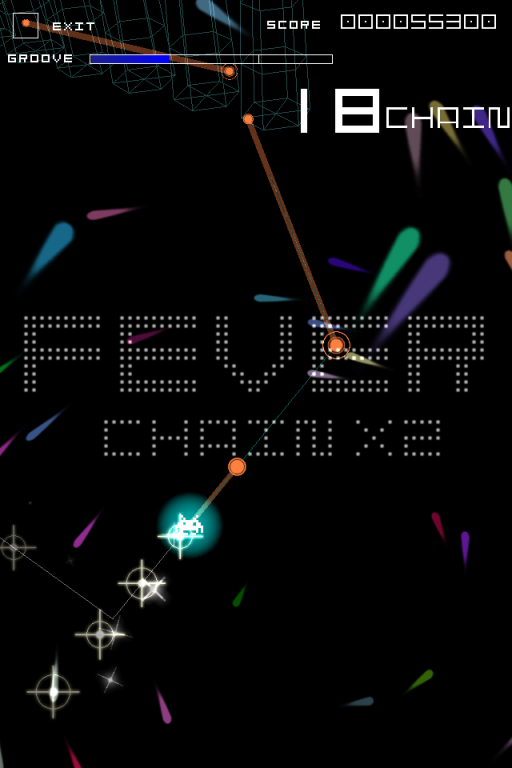 The game gets especially crazy and fun when a fast song is playing and the line begins to plummet into the screen, forcing you to pay attention to the music since the graphics are too simple to indicate depth. Interestingly, Groove Coaster also features notes called ad-libs. The game doesn’t penalize you for tapping if there’s no note near. Because of this, you’re free to tap along to the music even if there’s no icon. While doing this you can sometimes find hidden ad-lib notes! This system rewards paying attention to the music rather than just the screen. The simplistic graphics suit the game quite well. 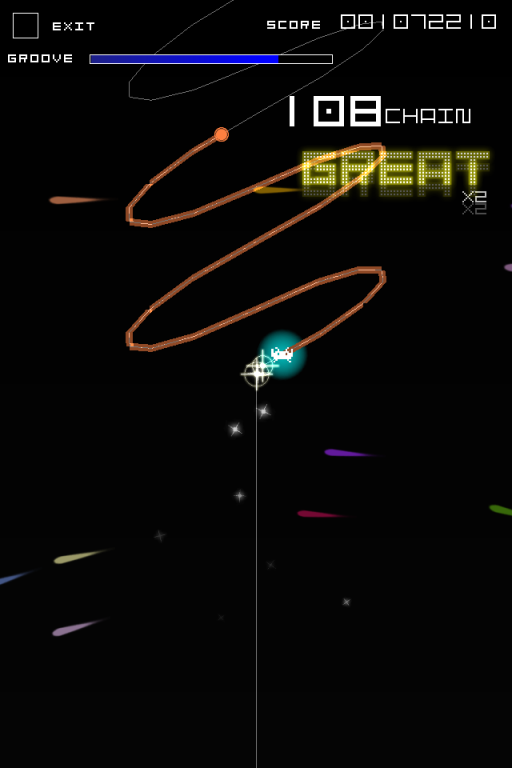 Groove Coaster features the same style as earlier iOS game, Space Invaders Infinity Gene (another awesome iOS game). Throughout the game, you can unlock additional skins to change the appearance, keeping the graphics simple but giving it a bit of flavor. The whole game has that HD retro look, even though it’s not a remake. It is, however, absolutely gorgeous. The music is exactly what you’d expect as well – electronic, techno, with a bit of pop and hip-hop. It’s the perfect blend. The soundtrack, by Taito houseband Zuntata, is available on iTunes already. 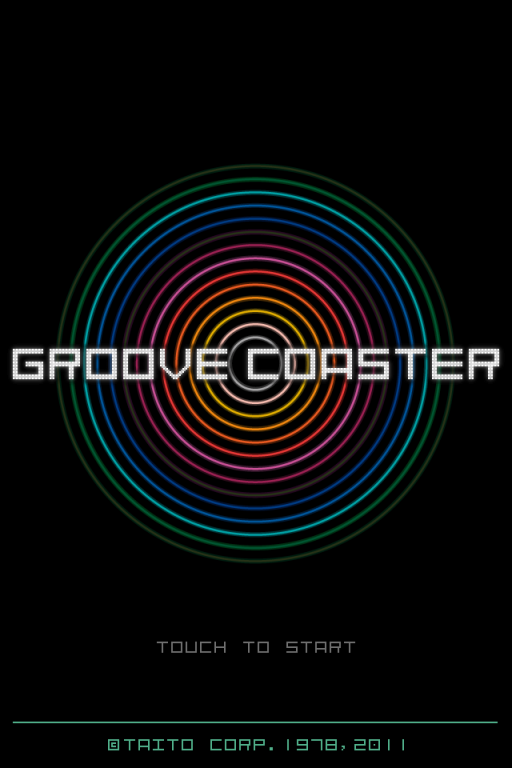 A variety of tracks are available in Groove Coaster, each with three difficulties. The game also features leaderboards and achievements. Additional avatars, skins, and items are available as DLC, but these seem overpriced to me. While another song for $0.99 isn’t terrible, items that provide a benefit for a single track just don’t seem worth it. The game is short and not very challenging, but I definitely don’t mean that as a negative. Taito doesn’t seem to be setting out to create a challenge or long game. Groove Coaster is a wonderful music experience. It’s definitely one of the “must plays” of the iOS, and at only $2.99 on the App Store, you should go grab it right now!